Just as you thought the 29er bubble had burst, along come three hugely capable machines to breathe new life back into big-wheel shredding. It dispels the myth that 29ers aren’t fun. 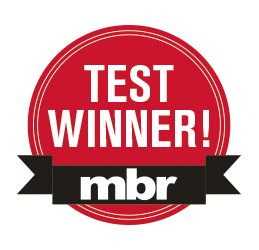 This product is featured in: Best mountain bikes. The Camber Expert Evo is very much a bike of two halves. Up front, it uses a beautifully formed Fact 9M carbon main triangle, with features that include full internal cable routing, a tapered head tube and a massively oversized PressFit 30 bottom bracket that ensures no effort is wasted when you stomp on the pedals. The M5 alloy rear-end is every bit as sleek with its 142mm dropouts and a moulded chainstay protector. >> Specialized mountain bikes: which model is right for you? Where both halves of the Camber frame unite is where the Evo transformation happens. A longer-stroke shock pumps the travel up to 120mm, 10mm more than on the standard Camber, while the custom Evo shock yoke slackens out the head angle and lowers the bottom bracket. All in, it’s a very different machine to the regular Camber. The Evo concept is more pervasive than frame geometry and travel alone, however. A wide 750mm bar, chunky tyres and a dropper post are all standard issue on the Evo. You also get a Specialized SWAT kit which includes a bottle cage with attached multi-tool and a chain-breaker tool cleverly stowed beneath the headset top-cap. This year RockShox has added an extra Bottomless Token to the 120mm-travel Pike 29er fork, bringing the total up to four. Not only does this make the fork more resistant to bottoming, it matches what we’ve been running in our own longterm test forks. The RC version on the Camber was easy to set up and probably all you’ll ever need in terms of adjustability — we never used any of the additional features on the Pike RCT3 fitted to the Orange. Thanks to Specialized’s AutoSag feature, the rear shock on the Camber is even easier to dial-in than is the fork. The FSR suspension is very sensitive too, thanks to the shock yoke that eliminates one of the shock bushings. Combined with a well-tuned Fox Float Factory shock, the rear-end of the Camber tracks terrain better than any other bike in this test. For 2015 Specialized has tweaked the spec on the Camber Expert Evo, the biggest change being a welcome switch from Formula brakes to Shimano XT. Other refinements include a smaller 30t chainring on the SRAM 1×11 chainset to help keep weary legs spinning on big days out, and the Specialized Command Post now gets a new under-bar lever that’s super-easy to use. More importantly, it’s been upgraded from 100mm to 125mm of drop. One slightly less apparent change is that the rim width has been pumped up to 29mm (internal) to offer improved tyre stability at lower pressures. We’re not totally sold on this final change. Yes, we love how stiff the new wheels are, but because the wider rim gives the tyre a much squarer profile, it feels like you reach the limits of the side-knobs sooner when railing turns. After the first couple of shakedown rides on the Camber, we ditched the 70mm stem, as it seemed to be the limiting factor on steeper descents. We went all the way down to a 35mm before settling on a 50mm as the best compromise between reach, control and comfort for climbing. With the cockpit sorted, the only things holding us back on the Camber were our skill and imagination. It’s light enough to easily dispense with long-distance marathon rides and lung-busting climbs, but it’s also solid enough to smash any descent you point it down. 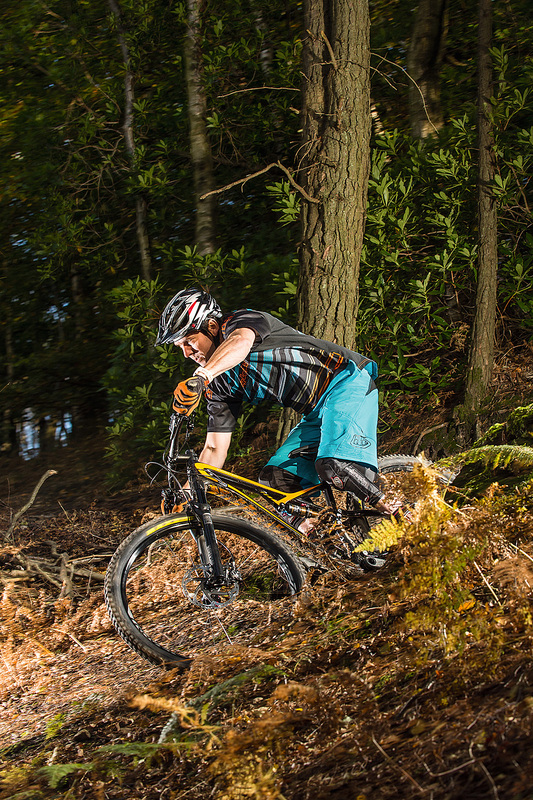 It has an unmatched ability to thunder through the roughest terrain but it’s equally easy to pop it up over a stump, or get light and reposition the bike on the trail at a moment’s notice. 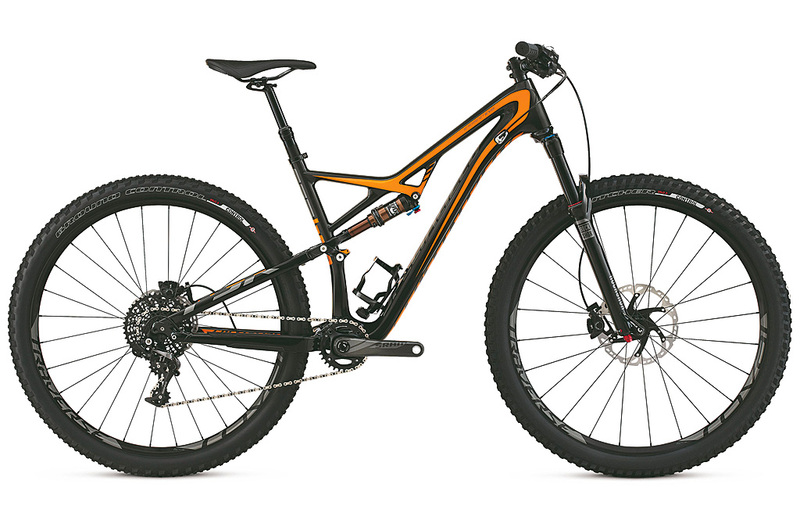 Granted, it doesn’t have the straight-line stability of the Whyte’s extra-long front-end, but the superior rear suspension and lower bottom bracket on the Camber ensure that trail speeds are higher on all but the steepest downhills. Once again, the Specialized Camber has proved that it’s the short-travel 29er to beat. With 120mm of superbly composed travel it can be ridden as fast as many longer-travel trail bikes, but the tight, responsive reaction to pedal inputs and lightweight carbon front-end on the Expert model mean it has no problems hanging with the shaved-leg XC crowd. Granted, an-out-and-out trail rider would probably benefit from the extra travel on the Stumpjumper, but the Camber Expert Evo is a great alternative for a racer coming up from XC, or anyone looking for a tighter-handling package to keep their skills razor-sharp.